Listed below are the names of Irish Born Medal of Honor Recipients for bravery in the line of duty during the war. Corporal, Company A, 98th Pennsylvania Infantry. Place and date: At Salem Heights, Va., 3 May 1863. Entered service at: Philadelphia, Pa. Birth: Ireland. Date of issue: 1 April 1898. Citation: Went 250 yards in front of his regiment toward the position of the enemy and under fire brought within the lines a wounded and unconscious comrade. Private, Company F, 16th New York Infantry. Place and date: At South Mountain, Md., 14 September 1862. Entered service at: Potsdam, N.Y. Born: 6 May 1843, Ireland. Date of issue: 11 September 1890. Citation: Single-handed and slightly wounded he accosted a squad of 14 Confederate soldiers bearing the colors of the 16th Georgia Infantry (C.S.A.). By an imaginary ruse he secured their surrender and kept them at bay when the regimental commander discovered him and rode away for assistance. Quartermaster, U.S. Navy. Born: 1841, Ireland. Accredited to: New Hampshire. G.O. No. : 17, 10 July 1863. Citation. Served on board the U.S.S. Crusader and the Keokuk during various actions of those vessels. Carrying out his duties skillfully while on board the U.S.S. Crusader, Q.M. Anderson, on all occasions, set forth the greatest intrepidity and devotion. During the attack on Charleston, while serving on board the U.S.S. Keokuk, Q.M. Anderson was stationed at the wheel when shot penetrated the house and, with the scattering of the iron, used his own body as a shield for his commanding officer. Sergeant Major, 16th U.S. Infantry. Place and date: Unknown, 1863-65. Entered service at: ------. Birth: Ireland. Date of issue: 28 February 1870. Citation: Gallantry in various actions during the rebellion. Sergeant, Company D, 7th New York Heavy Artillery. Place and date: At Cold Harbor, Va., 3 June 1864. Entered service at: ------. Birth: Ireland. Date of issue: 1 December 1864. Citation: Shot a Confederate color bearer, rushed forward and seized his colors, and although exposed to heavy fire, regained the lines in safety. Surgeon, 48th Pennsylvania Infantry. Place and date: At Petersburg, Va., 2 April 1865. Entered service at: Philadelphia, Pa. Born: 12 May 1838, Ireland. Date of issue: 21 July 1897. Citation: Removed severely wounded officers and soldiers from the field while under a heavy fire from the enemy, exposing himself beyond the call of duty, thus furnishing an example of most distinguished gallantry. Boatswain's Mate, U.S. Navy. Born: 1838, Ireland. Accredited to: New York. G.O. No. : 11, 3 April 1863. Citation: Served on board the U.S.S. Louisville. Carrying out his duties through the thick of battle and acting as captain of a 9-inch gun, Bradley consistently showed, "Attention to duty, bravery, and coolness in action against the enemy." Private, Company A, 74th New York Infantry. Place and date: At Chancellorsville, Va., 2 May 1863. Entered service at: Allegheny County, Pa. Birth: Ireland. Date of issue: 29 June 1866. Citation: Volunteered on a dangerous service and brought in valuable information. Seaman, U.S. Navy. Born: 1832, Ireland. Accredited to: Massachusetts. G.O. No. : 17, 10 July 1863. Citation: On board the U.S.S. Mississippi during attacks on Forts Jackson and St. Philip and during the taking of New Orleans, 24-25 April 1862. Taking part in the actions which resulted in the damaging of the Mississippi and several casualties on it, Brennan showed skill and courage throughout the entire engagements which resulted in the taking of St. Philip and Jackson and in the surrender of New Orleans. Sergeant, Company E, 164th New York Infantry. Place and date: At Petersburg, Va., 17 June 1864. Entered service at: New York, N.Y. Birth: Ireland. Date of issue: 18 January 1894. Citation: Rescued a wounded comrade who lay exposed to the enemy's fire, receiving a severe wound in the effort. Corporal, Company G, 62d New York Infantry. Place and date: At Fredericksburg and Salem Heights, Va., 3-4 May 1863. Entered service at: New York, N.Y. Born: 6 July 1841, Ireland. Date of issue: 24 November 1880. Citation: Severely wounded while carrying the colors, he continued at his post, under fire, until ordered to the rear. Private, Company A, 5th New York Cavalry. Place and date: At Hanover Courthouse, Va., 30 June 1863. Entered service at: ------. Birth: Ireland. Date of issue: 11 February 1878. Citation: Capture of battle flag. Boatswain's Mate, U.S. Navy. Born: 1838, Ireland. Accredited to: New York. G.O. No. : 11, 3 April 1863. Citation: Served on board the U.S.S. Louisville. Carrying out his duties through the thick of battle and acting as captain of a 9-inch gun, Brynes consistently showed "Attention to duty, bravery, and coolness in action against the enemy." Private, Company I, 30th Ohio Infantry. Place and date: At Vicksburg, Miss., 22 May 1863. Entered service at: ------. Birth: Ireland. Date of issue: 14 August 1894. Citation: Gallantry in the charge of the "volunteer storming party." Sergeant, Company E, 82d New York Infantry. Place and date: At Gettysburg, Pa., 2 July 1863. Entered service at: ------. Birth: Ireland. Date of issue: 6 February 1888. Citation: Captured the flag of the 7th Virginia Infantry (C.S.A. ), being twice wounded in the effort. Private, Company C, 25th Massachusetts Infantry. Place and date: At Cold Harbor, Va., 3 June 1864. Entered service at: Northbridge, Mass. Birth: Ireland. Date of issue: 14 September 1888. Citation: Two color bearers having been shot dead one after the other, the last one far in advance of his regiment and close to the enemy's line, this soldier rushed forward, and, under a galling fire, after removing the dead body of the bearer therefrom, secured the flag and returned with it to the Union lines. Landsman, U.S. Navy. Born: 1837, Ireland. Accredited to: New York. G.O. No. : 45, 31 December 1864. Citation: Served on board the U.S.S. Lackawanna during successful attacks against Fort Morgan, rebel gunboats and the ram Tennessee, in Mobile Bay, 5 August 1864. Displaying great coolness and exemplary behavior as first sponger of a gun, Cassidy, by his coolness under fire, received the applause of his officers and the guncrew throughout the action which resulted in the capture of the prize ram Tennessee and in the destruction of batteries at Fort Morgan. Colonel, 114th Pennsylvania Infantry. Place and date: At Fredericksburg, Va., 13 December 1862. Entered service at: Philadelphia, Pa. Born: 4 February 1838, Ireland. Date of issue: 10 March 1893. Citation: Gallantly led his regiment in battle at a critical moment. Ordinary Seaman, U.S. Navy. Born: 1842, Ireland. Accredited to: Maryland. G.O. No. : 59, 22 June 1865. Citation: On board the U.S.S. Minnesota, in action during the assault on Fort Fisher, 15 January 1865. Landing on the beach with the assaulting party from his ship, Connor charged up to the palisades and, when more than two-thirds of the men became seized with panic and retreated on the run, risked his life to remain with a wounded officer. With the enemy concentrating his fire on the group, he waited until after dark before assisting in carrying the wounded man from the field. Private, Company E, 43d New York Infantry. Place and date: At Fishers Hill, Va., 22 September 1864. Entered service at:------. Birth: Ireland. Date of issue: 6 October 1864. Citation: Capture of flag. Coxswain, U.S. Navy. Born: 1832, Ireland. Accredited to: New York. G.O. No. : 45, 31 December 1864. Second award. Citation: On board the U.S.S. Brooklyn during action against rebel forts and gunboats and with the ram Tennessee, in Mobile Bay, 5 August 1864. Despite severe damage to his ship and the loss of several men on board as enemy fire raked her decks from stem to stern, Cooper fought his gun with skill and courage throughout the furious battle which resulted in the surrender of the prize rebel ram Tennessee and in the damaging and destruction of batteries at Fort Morgan. Private, Company F, 40th Massachusetts Infantry. Place and date: At Drurys Bluff, Va., 15 May 1864. Entered service at: East Stoughton, Mass. Birth: Ireland. Date of issue: 7 November 1896. Citation: Individually demanded and received the surrender of 7 armed Confederates concealed in a cellar, disarming and marching them in as prisoners of war. Corporal, Company I, 82d New York Infantry. Place and date: At Bristoe Station, Va., 14 October 1863. Entered service at: ------. Birth: Ireland. Date of issue: 1 December 1864. Citation: Capture of flag of 22d or 28th North Carolina (C.S.A.). Assistant Surgeon, 33d New York Infantry. Place and date: At Antietam, Md., 17 September 1862. Entered service at: Seneca Falls, N.Y. Born: 4 January 1838, Ireland. Date of issue: 30 March 1898. Citation: Voluntarily exposed himself to great danger by going to the fighting line there succoring the wounded and helpless and conducting them to the field hospital. Sergeant, Company I, 107th Pennsylvania Infantry. Place and date: At Danby's mills, Va., 6 February 1860. Entered service at: Honesdale, Pa. Birth: 22 April 1848, Ireland. Date of issue: 29 August 1894. Citation: Sprang between the lines and brought out a wounded comrade about to be burned in the brush. Private, Company B, 69th New York Infantry. Place and date: At Fredericksburg, Va., 13 December 1862. Entered service at:------. Birth: Ireland. Date of issue: 17 January 1894. Citation: Voluntarily carried a wounded officer off the field from between the lines; while doing this he was himself wounded. Corporal, Company E., 164th New York Infantry. Place and date: At Cold Harbor, Va., 7 June 1864. Entered service at: New York, N.Y. Birth: Ireland. Date of issue: 13 December 1893. Citation: After making a successful personal reconnaissance, he gallantly led the skirmishers in a night attack, charging the enemy, and thus enabling the pioneers to put up works. Coal Heaver, U.S. Navy. Born: 1841, Ireland. Accredited to: Pennsylvania. G.O. No. : 45, 31 December 1864. Citation: On board the U.S.S. Richmond during action against rebel forts and gunboats and with the ram Tennessee in Mobile Bay, 5 August 1864. Although knocked down and seriously wounded in the head, Doolen refused to leave his station as shot and shell passed. Calm and courageous, he rendered gallant service throughout the prolonged battle which resulted in the surrender of the rebel ram Tennessee and in the successful attacks carried out on Fort Morgan despite the enemy's heavy return fire. Private, Company B, 13th Pennsylvania Cavalry. Place and date: At Jefferson, Va., 12 October 1863. Entered service at: Philadelphia, Pa. Born: 10 May 1844, Ireland. Date of issue: 23 January 1897. Citation: At the head of a detachment of his company dashed across an open field, exposed to a deadly fire from the enemy, and succeeded in dislodging them from an unoccupied house, which he and his comrades defended for several hours against repeated attacks, thus preventing the enemy from flanking the position of the Union forces. Landsman, U.S. Navy. Born: 1844, Ireland. Accredited to: New York. G.O. No. : 45, 31 December 1864. Citation: As a landsman on board the U.S.S. Lackawanna, Dougherty acted gallantly without orders when the powder box at his gun was disabled under the heavy enemy fire, and maintained a supply of powder throughout the prolonged action. Dougherty also aided in the attacks on Fort Morgan and in the capture of the prize ram Tennessee. Private, Company B, 4th Massachusetts Cavalry. Place and date: At Ashepoo River, S.C., 24 May 1864. Entered service at: Fall River, Mass. Birth: Ireland. Date of issue: 21 January 1897. Citation: Volunteered as a member of a boatcrew which went to the rescue of a large number of Union soldiers on board the stranded steamer Boston, and with great gallantry assisted in conveying them to shore, being exposed during the entire time to a heavy fire from a Confederate battery. Sergeant, Company C, 4th Vermont Infantry. Place and date: At Weldon Railroad, Va., 23 June 1864. Entered service at: Chester, Vt. Birth: Ireland. Date of issue: 18 January 1893. Citation: Saved the colors of his regiment when it was surrounded by a much larger force of the enemy and after the greater part of the regiment had been killed or captured. Coal Heaver, U.S. Navy. Born: 1840, Ireland. Accredited to: New York. Citation: On board the flagship U.S.S. Hartford during successful attacks against Fort Morgan, rebel gunboats and the rebel ram Tennessee, Mobile Bay, 5 August 1864. With his ship under terrific enemy shellfire, Dunphy performed his duties with skill and courage throughout this fierce engagement which resulted in the capture of the rebel ram Tennessee. First Sergeant, Company C, 2d New Jersey Infantry. Place and date: At Wilderness, Va., 6 May 1864. Entered service at: Newark, N.J. Born: 16 November 1841, Ireland. Date of issue: 13 February 1891. Citation: During a rout and while under orders to retreat seized the colors, rallied the men, and drove the enemy back. Private, Company K, 37th New York Infantry. Place and date: At Williamsburg, Va., 5 May 1862. At Fair Oaks, Va., 30-31 May 1862. At Big Shanty, Ga., 14-15 June 1864. Entered service at: Freehold, N.J. Birth: Ireland. Date of issue: 13 February 1891. Citation: At Williamsburg, Va., assisted in driving rebel skirmishers to their main line. Participated in action, at Fair Oaks, Va., though excused from duty because of disability. In a charge with his company at Big Shanty, Ga., was the first man on the enemy's works. Boy, U.S. Navy. Born: 1840, Ireland. Accredited to: New York. G.O. No. : 11, 3 April 1863. Citation: Served on board the U.S.S. Pensacola in the attack on Forts Jackson and St. Philip and at the taking of New Orleans, 24 and 25 April 1862. Swept from the bridge by a shell, which wounded the signal quartermaster, Flood returned to the bridge after assisting the wounded man below and taking over his duties, "Performed them with coolness, exactitude and the fidelity of a veteran seaman. His intelligence and character cannot be spoken of too warmly." Corporal, Company K, 14th Connecticut Infantry. Place and date: At Gettysburg, Pa., 3 July 1863. Entered service at: Sprague, Conn. Birth: Ireland. Date of issue: 1 December 1864. Citation: Capture of flag of 52d North Carolina Infantry (C.S.A.). First Lieutenant, Company E, 88th New York Infantry. Place and date: At Sailors Creek, Va., 6 April 1865. Entered service at: ------. Birth: Ireland. Date of issue: 10 May 1865. Citation: Capture of flag. Seaman, U.S. Navy. Born: 1832, Ireland. Accredited to: New York. G.O. No. : 45, 31 December 1864. Citation: As seaman on board the U.S.S. Calena in the engagement at Mobile Bay, 5 August 1864. Serving gallantly during this fierce battle, which resulted in the capture of the rebel ram Tennessee, and the damaging of Fort Morgan. Gardner behaved with conspicuous coolness under the fire of the enemy. Sergeant, Company K, 47th New York Infantry. Place and date: At Chapins Farm, Va., 29 September 1864. Entered service at: ------. Birth: Ireland. Date of issue: 6 April 1865. Citation: Fell dead while planting the colors of his regiment on the enemy's works. Lieutenant, Company C, 2d New York Cavalry. Place and date: At Sailors Creek, Va., 6 April 1865. Entered service at:------. Birth: Ireland. Date of issue: 3 May 1865. Citation: Capture of flag of 12th Virginia Infantry (C.S.A.). Captain of the Forecastle, U.S. Navy. Born: 1824, Ireland. Accredited to. Ohio. G.O. No. : 45, 31 December 1864. Citation: Served as captain of the forecastle on board the U.S.S. Kearsarge when she destroyed the Alabama off Cherbourg, France, 19 June 1864. Acting as captain of a gun during the bitter engagement, Haley exhibited marked coolness and good conduct and was highly commended by his division officer for his gallantry and meritorious achievement under enemy fire. Landsman, U.S. Navy. Born: 1849, Ireland. Accredited to: Massachusetts. G.O. No. : 11, 3 April 1863. Citation: Harrington, a landsman from the U.S.S. Pocahontas, participated in a shore mission to procure meat for the ship's crew. While returning to the beach, the party was fired on from ambush and several men killed or wounded. Cool and courageous throughout his action, Harrington rendered gallant service against the enemy and in administering to the casualties. Sergeant, Company G, 1st Rhode Island Light Artillery. Place and date: At Petersburg, Va., 2 April 1865. Entered service at: Providence, R.I. Birth: Ireland. Date of issue: 16 June 1866. Citation: Was one of a detachment of 20 picket artillerymen who voluntarily accompanied an infantry assaulting party and who turned upon the enemy the guns captured in the assault. Corporal, Company D, 23d Illinois Infantry. Place and date: At Petersburg, Va., 2 April 1865. Entered service at: Chicago, Ill. Birth: Ireland. Date of issue: 12 May 1865. Citation: Conspicuous gallantry as color bearer in the assault on Fort Gregg. Second Class Fireman, U.S. Navy. Born: 1841, Ireland. Accredited to: New York. G.O. No. : 45, 31 December 1864. Citation: Hinnegan served on board the U.S.S. Agawam, as one of a volunteer crew of powder boat, which was exploded near Fort Fisher, 23 December 1864. The powder boat, towed in by the Wilderness to prevent detection by the enemy, cast off and slowly steamed to within 300 yards of the beach. After fuses and fires had been lit and a second anchor with short scope let go to assure the boat's tailing inshore, the crew again boarded the Wilderness and proceeded a distance of 12 miles from shore. Less than 2 hours later the explosion took place, and the following day fires were observed still burning at the forts. Captain, Company H, 11th Connecticut Infantry. Place and date: At Fort Harrison, Va., 29 September 1864. Entered service at: Winsted, Conn. Born: 3 March 1843, Ireland Date of issue: 19 November 1897. Citation: While acting as an aide and carrying an important message, was severely wounded and his horse killed but delivered the order and rejoined his general. Sergeant, U.S. Marine Corps. 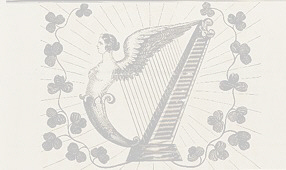 Born: 1834, Sligo County, Ireland. Accredited to: New York. G.O. No. : 45, 31 December 1864. Citation: On board the U.S.S. Brooklyn during action against rebel forts and gunboats and with the ram Tennessee in Mobile Bay, 5 August 1864. Despite severe damage to his ship and the loss of several men on board as enemy fire raked the decks, Sgt. Hudson fought his gun with skill and courage throughout the furious 2-hour battle, which resulted in the surrender of the rebel ram Tennessee. Seaman, U.S. Navy. Born: 1819, Ireland. Accredited to: Illinois. G.O. No. : 45, 31 December 1864. Citation: Served as seaman on board the U.S.S. Signal, which was attacked by field batteries and sharpshooters and destroyed in Red River, 5 May 1864. Proceeding up the Red River, the U.S.S. Signal engaged a large force of enemy field batteries and sharpshooters, returning their fire until the ship was totally disabled, at which time the white flag was raised. Although wounded, Hyland courageously went in full view of several hundred sharpshooters and let go the anchor, and again to slip the cable, when the raking enemy fire again wounded him. First Sergeant, Company H, 14th Michigan Infantry. Place and date: At Jonesboro, Ga., 1 September 1864. Entered service at: Ann Arbor, Mich. Born: 1839, Ireland. Date of issue: 28 April 1896. Citation: In a charge by the 14th Michigan Infantry against the entrenched enemy was the first man over the line of works of the enemy, and demanded and received the surrender of Confederate Gen. Daviel Govan and his command. Chief Boatswain's Mate, U.S. Navy. Born: 1835, Ireland. Accredited to: New York. G.O. No. : 45, 31 December 1864. Citation: Served as chief boatswain's mate on board the U.S. Ironclad, Chickasaw, Mobile Bay, 5 August 1864. Although his enlistment was up, Jones volunteered for the battle of Mobile Bay, going on board the Chickasaw from the Vincennes where he then carried out his duties gallantly throughout the engagement with the enemy, which resulted in the capture of the rebel ram Tennessee. First Sergeant, Company A, 73d New York Infantry. Place and date: At Spotsylvania, Va., 12 May 1864. Entered service at: New York, N.Y. Birth: Ireland. Date of issue: 1 December 1864. Citation: Capture of flag of 65th Virginia Infantry (C.S.A.). Corporal, Company K, 100th New York Infantry. Place and date: At Petersburg, Va., 2 April 1865. Entered service at: ------. Birth: Ireland. Date of issue: 12 May 1865. Citation: Gallantry as color bearer in the assault on Fort Gregg. Sergeant Major, 182d New York Infantry. Place and date: At North Anna River, Va., 23 May 1864. Entered service at: Staten Island, N.Y. Birth: Ireland. Date of issue: 25 October 1867. Citation: Voluntarily and at the risk of his life carried orders to the brigade commander, which resulted in saving the works his regiment was defending. Second Class Fireman, U.S. Navy. Birth: Ireland. Accredited to: Ireland. G.O. No. : 11, 3 April 1863. Citation: Served as second-class fireman on board the U.S.S. Ceres in the fight near Hamilton, Roanoke River, 9 July 1862. When his ship was fired on by the enemy with small arms, Kelley returned the raking fire, courageously carrying out his duties through the engagement and was spoken of for "good conduct and cool bravery under enemy fires," by the commanding officer. Private, Company A, 6th New York Cavalry. Place and date: At Front Royal, Va., 16 August 1864. Entered service at: ------. Birth: Ireland. Date of issue: 26 August 1864. Citation: Capture of flag. Private, Company M, 2d U.S. Artillery. Place and date: At Trevilian Station, Va., 11 June 1864. Entered service at: ------. Birth: Ireland. Date of issue: 19 August 1892. Citation: Remained at his gun, res1sting with its implements the advancing cavalry, and thus secured the retreat of his detachment. Corporal, Company E, 67th Pennsylvania Infantry. Place and date: At Sailors Creek, Va., 6 April 1865. Entered service at: Albany, N.Y. Birth: Ireland. Date of issue: 3 May 1865. Citation: Capture of battle flag of 50th Georgia Infantry (C.S.A.). Captain, Company C, 14th Pennsylvania Cavalry. Place and date: At Moorfield, W. Va., 7 August 1864. Entered service at: Pittsburgh, Pa. Born: 24 April 1843, Ireland. Date of issue: 13 June 1894. Citation: After being most desperately wounded, he captured the colors of the 8th Virginia Cavalry (C.S.A.). Seaman, U.S. Navy. Born: 1841, Ireland. Accredited to: Massachusetts. G.O. No. : 32, 16 April 1864. Citation. Off Yazoo City, Miss., 5 March 1864, embarking from the Marmora with a 12-pound howitzer mounted on a field carriage, Laffey landed with the gun and crew in the midst of heated battle and, bravely standing by his gun despite enemy rifle fire which cut the gun carriage and rammer, contributed to the turning back of the enemy during the fierce engagement. Private, Troop H, 6th U.S. Cavalry. Place and date: At Fairfield, Pa., 3 July 63. Entered service at: -----. Birth: Ireland. Date of issue: 12 July 1895. Citation: Seized the regimental flag upon the death of the standard bearer in a hand-to-hand fight and prevented it from falling into the hands of the enemy. Captain of the Afterguard, U.S. Navy. Born: 1834, Ireland. Accredited to: Massachusetts. G.O. No. : 59, 22 June 1865. Citation: On board the U.S.S. Rhode Island which was engaged in rescuing men from the stricken Monitor in Mobile Bay, on 30 December 1862. After the Monitor sprang a leak and went down, Logan courageously risked his life in a gallant attempt to rescue members of the crew. Although sacrificing his life during the hazardous operation, he had made every effort possible to save the lives of his fellow men. Private, Company K, 42d New York Infantry. Place and date: At Masons Island, Md., 3 September 1861. Entered service at: New York, N.Y. Born: 28 September 1841, Ireland. Date of issue: 22 March 1898. Citation: Assisted a wounded comrade to the riverbank and, under heavy fire of the enemy, swam with him across a branch of the Potomac to the Union lines. Private, Company H, 148th New York Infantry. Place and date: At Hatchers Run, Va., 2 April 1865. Entered service at: ------. Birth: Ireland. Date of issue: 21 September 1888. Citation: Capture of flag of 8th Mississippi Infantry (C.S.A.). Sergeant, U.S. Marine Corps. Born: 1826, Derry, Ireland. Accredited to: Pennsylvania. G.O. No: 45, 31 December 1864. Citation: As captain of a gun on board the U.S.S. Richmond during action against rebel forts and gunboats and with the ram Tennessee in Mobile Bay, 5 August 1864. Despite damage to his ship and the loss of several men on board as enemy fire raked her decks, Sgt. Martin fought his gun with skill and courage throughout the furious 2_hour battle which resulted in the surrender of the rebel ram Tennessee and in the damaging and destruction of batteries at Fort Morgan. Seaman, U.S. Navy. Born: 1839, Ireland. Accredited to: New York. G.O. No. : 11, 3 April 1863. Citation: Captain of a gun on board the U.S.S. Varuna during an attack on Forts Jackson and St. Philip, 24 April 1862. His ship was taken under furious fire by the rebel Morgan and severely damaged by ramming. Steadfast at his station through the thickest of the fight, Martin inflicted damage on the enemy, remaining cool and courageous although the Varuna, so badly damaged that she was forced to beach, was finally sunk. Boatswain's Mate, U.S. Navy. Born: 1833, Ireland. Accredited to: Illinois. G.O. No. : 45, 31 December 1864. Citation: Served as boatswain's mate on board the U.S.S. Signal, Red River, 5 May 1864. Proceeding up the Red River, the U.S.S. Signal engaged a large force of enemy field batteries and sharpshooters, returning the fire until the ship was totally disabled, at which time the white flag was raised. Serving as gun captain and wounded early in the battle, McCormick bravely stood by his gun in the face of the enemy fire until ordered to withdraw. Corporal, Battery D, 5th U.S. Artillery. Place and date: At Bull Run, Va., 21 July 1861. Entered service at:------. Birth: Ireland. Date of issue: 28 August 1897. Citation: Through his personal exertions under a heavy fire, one of the guns of his battery was brought off the field; all the other guns were lost. RQuartermaster, U.S. Navy. Born: 1831, Ireland. Accredited to: New York. G.O. No. : 11, 3 April 1863. Citation: McGowan occupied one of the most responsible positions on the U.S.S. Varuna during the attacks on Forts Jackson and St. Philip and in action against the rebel ship Morgan on 24 April 1862. Although guns were raking the decks from behind him, McGowan remained steadfast at the wheel throughout the thickest of the fight, continuing at his station and rendering service with the greatest courage and skill until his ship, repeatedly holed and twice rammed by the enemy, was beached and sunk. Captain of the Afterguard, U.S. Navy. Born: 1838, Ireland. Accredited to: Virginia. G.O. No. : 45, 21 December 1864. Citation: Montgomery served on board the U.S.S. Agawam, as one of a volunteer crew of a powder boat, which was exploded near Fort Fisher, 23 December 1864. The powder boat, towed in by the Wilderness to prevent detection by the enemy, cast off and slowly steamed to within 300 yards of the beach. After fuses and fires had been lit and a second anchor with short scope let go to assure the boat's tailing inshore, the crew again boarded the Wilderness and proceeded a distance of 12 miles from shore. Less than 2 hours later the explosion took place, and the following day fires were observed still burning at the forts. Landsman, U.S. Navy. Born: 1839, Ireland. Accredited to: New York. G.O. No. : 32, 16 April 1864. Citation: Serving on board the U.S. Steam Gunboat Marblehead off Legareville, Stono River, 25 December 1863, during an engagement with the enemy on John's Island. Wounded in the fierce battle, Moore returned to his quarters until so exhausted by loss of blood that he had to be taken below. This engagement resulted in the enemy's abandonment of his positions, leaving a caisson and one gun behind. Coxswain, U.S. Navy. Entered service at: Lansingburg, N.Y. Born: 3 November 1842, Ireland G.O. No. : 59, 22 June 1865. Citation: Serving as coxswain on board the U.S.S. Carondelet, Morrison was commended for meritorious conduct in general and especially for his heroic conduct and his inspiring example to the crew in the engagement with the rebel ram Arkansas, Yazoo River, 15 July 1862. When the Carondelet was badly cut up, several of her crew killed, many wounded and others almost suffocated from the effects of escaped steam, Morrison was the leader when boarders were called on deck, and the first to return to the guns and give the ram a broadside as she passed. His presence of mind in time of battle or trial is reported as always conspicuous and encouraging. Major, 116th Pennsylvania Infantry. Place and date: At Chancellorsville, Va., 4_5 May 1863. Entered service at: Philadelphia, Pa. Born: 1 April 1839, Ireland. Date of issue: 26 March 1895. Citation: In command of the picket line held the enemy in check all night to cover the retreat of the Army. Lieutenant Colonel, 170th New York Infantry. Place and date: At North Anna River, Va., 24 May 1864. Entered service at: New York, N.Y. Birth: Ireland. Date of issue: 15 January 1897. Citation: This officer, commanding the regiment, kept it on the field exposed to the fire of the enemy for 3 hours without being able to fire one shot in return because of the ammunition being exhausted. Sergeant, Company F, 14th Wisconsin Infantry. Place and date: At Corinth, Miss., 3 October 1862. Entered service at: ------. Birth: Ireland. Date of issue: 22 January 1892. Citation: Although wounded three times, carried the colors throughout the conflict. Private, Company K, 5th Ohio Infantry. Place and date: At Antietam, Md., 17 September 1862. Entered service at: Cincinnati, Ohio. Birth: Ireland. Date of issue: 11 September 1866. Citation: Capture of flag of 13th Alabama Infantry (C.S.A.). Boatswain's Mate, U.S. Navy. Born: 1823, Ireland. Accredited to: New York. Citation: Served as boatswain's mate on board the U.S.S. Metacomet, during action against rebel forts and gunboats and with the ram Tennessee in Mobile Bay, 5 August 1864. Despite damage to his ship and the loss of several men on board as enemy fire raked her decks, Murphy performed his duties with skill and courage throughout a furious 2_hour battle which resulted in the surrender of the rebel ram Tennessee and in the damaging and destruction of batteries at Fort Morgan. Corporal, Company I, 31st Illinois Infantry. Place and date: At Vicksburg, Miss., 22 May 1863. Entered service at: Pekin, Ill. Birth: Ireland. Date of issue: 14 August 1893. Citation: Voluntarily crossed the line of heavy fire of Union and Confederate forces, carrying a message to stop the firing of one Union regiment on another. First Sergeant, Company G, 146th New York Infantry. Place and date: At Five Forks, Va., 1 April 1865. Entered service at: New York, N.Y. Birth: Ireland. Date of issue: 10 May 1865. Citation: Capture of flag. Orderly Sergeant, U.S. Marine Corps. Born: 1840, County of Caven, Ireland. Accredited to: Massachusetts. G.O. No. : 32, 16 April 1864. Citation: Serving on board the U.S.S. Fort Henry, Crystal River, Fla., 15 June 1863. Reconnoitering on the Crystal River on this date and in charge of a boat from the Fort Henry, Orderly Sgt. Nugent ordered an assault upon a rebel breastwork fortification. In this assault, the orderly sergeant and his comrades drove a guard of 11 rebels into the swamp, capturing their arms and destroying their camp equipage while gallantly withholding fire to prevent harm to a woman among the fugitives. On 30 July 1863, he further proved his courage by capturing a boat off Depot Key, Fla., containing 2 men and a woman with their baggage. Captain, Company C, 37th New York Infantry. Place and date: At Fair Oaks, Va., 31 May and 1 June 1862. Entered service at: New York. Birth: Ireland. Date of issue: 20 January 1891. Citation: Gallantly maintained the line of battle until ordered to fall back. Private, Company A, 1st New York (Lincoln) Cavalry. Place and date: At Waynesboro, Va., 2 March 1865. Entered service at: ------. Birth: Ireland. Date of issue: 26 March 1865. Citation: Capture of flag and of a Confederate officer with his horse and equipment. Coal Heaver, U.S. Navy. Born: 1842, Ireland. Accredited to: New York. G.O. No. : 45, 31 December 1864. Citation: On board the flagship U.S.S. Hartford, during successful attacks against Fort Morgan, rebel gunboats and the ram Tennessee in Mobile Bay on 5 August 1864. Although a patient in the sick bay, O'Connell voluntarily reported at his station at the shell whip and continued to perform his duties with zeal and courage until his right hand was severed by an enemy shellburst. Private, Company E, 1st U.S. Cavalry. Place and date: Unknown. Entered service at:------. Birth: Ireland. Date of issue: 5 January 1865. Citation: Date and place of act not of record in War Department. First Lieutenant, Company A, 11th Missouri Infantry. Place and date: At Vicksburg, Miss., 22 May 1863. At Fort DeRussey, La., 14 March 1864. Entered service at: Illinois. Born: 30 April 1830, Ireland. Date of issue. 11 September 1897. Citation Voluntarily joined the color guard in the assault on the enemy's works when he saw indications of wavering and caused the colors of his regiment to be planted on the parapet. Voluntarily placed himself in the ranks of an assaulting column (being then on staff duty) and rode with it into the enemy's works, being the only mounted officer present, was twice wounded in battle. Private, Troop H, 6th U.S. Cavalry. Place and date: At Fairfield, Pa., 3 July 63. Entered service at: -----. Birth: Ireland. Date of issue: 12 July 1895. Citation: Seized the regimental flag upon the death of the standard bearer in a hand to hand fight and prevented it from falling into the hands of the enemy. Sergeant, Company E, 21st Massachusetts Infantry. Place and date. At Fredericksburg, Va., 11 December 1862. Entered service at: West Boylston, Mass. Birth: Ireland. Date of issue: 30 March 1866. Citation: Seized the colors of his regiment, the color bearer having been shot down, and bore them to the front where both his arms were carried off by a shell. Landsman, U.S. Navy. Born: 1841, Ireland. Accredited to: Massachusetts. G.O. No. : 45, 31 December 1864. Citation: Served on board the U.S.S. Oneida in the engagement at Mobile Bay, 5 August 1864. Severely wounded, Preston remained at his gun throughout the engagement, which resulted in the capture of the rebel ram Tennessee and the damaging of Fort Morgan, carrying on until obliged to go to the surgeon to whom he reported himself as "only slightly injured." He then assisted in taking care of the wounded below and wanted to be allowed to return to his battle station on deck. Upon close examination it was found that he was wounded quite severely in both eyes. Major, 88th New York Infantry. Place and date: At Savage Station, Va., 29 June 1862. Entered service at: New York, N.Y. Born: 13 September 1833, Ireland. Date of issue: 18 February 1891. Citation: Led his regiment on the enemy's battery, silenced the guns, held the position against overwhelming numbers, and covered the retreat of the 2d Army Corps. Private, Company B, 69th New York Infantry. Place and date: At Malvern Hill, Va., 1 July 1862. Entered service at: New York, N.Y. Birth: Ireland. Date of issue: 2 August 1897. Citation: Having been wounded and directed to the rear, declined to go, but continued in action, receiving several additional wounds, which resulted in his capture by the enemy and his total disability for military service. Corporal, U.S. Marine Corps. Born: 1836, County of Monahan, Ireland. Accredited to: Pennsylvania. G.O. No. : 59, 22 June 1865. Citation: On board the U.S.S. Minnesota in the assault on Fort Fisher, 15 January 1865. Landing on the beach with the assaulting party from his ship, Cpl. Rannahan advanced to the top of the sand hill and partly through the breach in the palisades despite enemy fire, which killed or wounded many officers and men. When more than two thirds of the men became seized with panic and retreated on the run, he remained with the party until dark when it came safely away, bringing its wounded, its arms and its colors. Private, Company M, 9th New York Cavalry. Place and date: At Winchester, Va., 19 September 1864. Entered service at: New York, N.Y. Birth: Ireland. Date of issue: 27 September 1864. Citation: Capture of Virginia State flag. Private, Company D, 1st Louisiana Cavalry. Place and date: At Fort Blakely, Ala., 4 April 1865. Entered service at: ------. Birth: Ireland. Date of issue: 8 June 1865. Citation: Captured the flag of the 6th Alabama Cavalry. Sergeant, U.S. Marine Corps. Born: 1835, Dublin, Ireland. Accredited to: New York. G.O. No. : 45, 31 December 1864. Citation: On board the U.S.S. Oneida during action against rebel forts and gunboats and with the ram Tennessee in Mobile Bay, 5 August 1864. Despite damage to his ship and the loss of several men on board as enemy fire raked her decks and penetrated her boilers, Sgt. Roantree performed his duties with skill and courage throughout the furious battle which resulted in the surrender of the rebel ram Tennessee and in the damaging and destruction of batteries at Fort Morgan. Private, Company I, 19th Massachusetts Infantry. Place and date: At Gettysburg, Pa., 3 July 1863. Entered service at: Roxbury, Mass. Birth: Ireland. Date of issue: 1 December 1864. Citation: Capture of flag of 57th Virginia Infantry (C.S.A.). Private, Company H, 81st Pennsylvania Infantry. Place and date: At Spotsylvania, Va., 12 May 1864. Entered service at: Tamaqua, Pa. Birth: Ireland. Date of issue: 1 December 1864. Citation: Capture of flag in a hand-to-hand conflict. Private, Company D, 11th Indiana Infantry Place and date: At Winchester, Va., 19 September 1864. Entered service at: Vigo County, Ind. Birth: Ireland. Date of issue: 4 April 1865. Citation: With one companion, captured 14 Confederates in the severest part of the battle. Private, Company A, 4th Massachusetts Cavalry. P/ace and date: At Ashepoo River, S.C., 24 May 1864. Entered service at: Spencer, Mass. Birth: Ireland. Date of issue: 21 January 1897. Citation: Volunteered as a member of a boat crew that went to the rescue of a large number of Union soldiers on board the stranded steamer Boston, and with great gallantry assisted in conveying them to shore, being exposed during the entire time to a heavy fire from a Confederate battery. Coxswain, U.S. Navy. Born: 1833, Ireland. Accredited to: New York. G.O. No. : 59, 22 June 1865. Citation: As coxswain on board the U.S.S. Hendrick Hudson, St. Marks, Fla., 5 and 6 March 1865. Serving with the army in charge of Navy howitzers during the attack on St. Marks and throughout the fierce engagement, Schutt made remarkable efforts in assisting transport of the gun, and his coolness and determination in courageously remaining by his gun while under the heavy fire of the enemy were a credit to the service to which he belonged. Colonel, 5th New Jersey Infantry. Place and date: At Chancellorsville, Va., 3 May 1863. Entered service at: Camden, N.J. Born: 6 December 1835, Ireland. Date of issue: 25 March 1896. Citation: Assuming command of a brigade, he rallied around his colors a mass of men from other regiments and fought these troops with great brilliancy through several hours of desperate conflict, remaining in command though wounded and inspiring them by his presence and the gallantry of his personal example. Private, Company E, 2d West Virginia Cavalry. Place and date: At Appomattox, Va., 8 April 1865. Entered service at: Ironton, Ohio. Birth: Ireland. Date of issue: 3 May 1865. Citation: Capture of flag of the Washington Artillery (C.S.A.). Quartermaster, U.S. Navy. Born: 1838, Ireland. Accredited to: New Hampshire. G.O. No. : 45, 31 December 1864. Citation: Served as second quartermaster on board the U.S.S. Kearsarge when she destroyed the Alabama off Cherbourg, France, 19 June 1864. Acting as captain of the 11-inch pivot gun of the second division, Smith carried out his duties courageously and deserved special notice for the deliberate and cool manner in which he acted throughout the bitter engagement. It is stated by rebel officers that this gun was more destructive and did more damage than any other gun of Kearsarge. Private, Company C, 16th Pennsylvania Cavalry. Place and date: At Hatchers Run, Va., 5_7 February 1865. Entered service at: Erie, Pa. Birth: Ireland. Date of issue: 16 September 1880. Citation: Gallantry and good conduct in action; bravery in a charge and reluctance to leave the field after being twice wounded. Private, Company G, 1st Maryland Infantry. Place and date. At Five Forks, Va., 1 April 1865. Entered service at: ------. Birth: Ireland. Date of issue: 27 April 1865. Citation. Capture of flag. Coxswain, U.S. Navy. Born: 1835, Ireland. Accredited to: New York. G.O. No. : 11, 3 April 1863. Citation: Served on board the U.S.S. Louisville during various actions of that vessel. During the engagements of the Louisville, Sullivan served as first captain of a 9_inch gun and throughout his period of service was "especially commended for his attention to duty, bravery, and coolness in action." First Lieutenant and Adjutant, 9th Massachusetts Infantry. Place and date: At Malvern Hill, Va., 1 July 1862. Entered service at: Boston, Mass. Birth: Ireland. Date of issue: 11 March 1896. Citation: Voluntarily took command of the 9th Massachusetts while adjutant, bravely fighting from 3 p.m. until dusk, rallying and re_forming the regiment under fire; twice picked up the regimental flag, the color bearer having been shot down, and placed it in worthy hands. Sergeant, Company G, 127th Illinois Infantry. Place and date: At Vicksburg, Miss., 22 May 1863. Entered service at: Chicago, Ill. Birth: Ireland. Date of issue: 9 July 1894. Citation: Gallantry in the charge of the "volunteer storming party." Corporal, Company H, 5th Ohio Infantry. Place and date: At Resaca, Ga., 14 May 1864. Entered service at: Hamilton County, Ohio. Birth: Ireland. Date of issue: 7 April 1865. Citation: Capture of flag. Private, Company E, 82d New York Infantry. Place and date: At Bristoe Station, Va., 14 October 1863. Entered service at: ------. Birth: Ireland. Date of issue: 6 June 1870. Citation: Gallantry in action while detailed as color bearer; was severely wounded. Corporal, Company D, 5th New York Cavalry. Place and date: At Cedar Creek, Va., 19 October 1864. Entered service at: ------. Birth: Ireland. Date of issue: 26 October 1864. Citation: Recaptured the flag of the 15th New Jersey Infantry. Corporal, Company E, 37th Massachusetts Infantry. Place and date: At Petersburg, Va., 2 April 1865. Entered service at: Williamstown, Mass. Birth: Ireland. Date of issue: 10 May 1865. Citation: Capture of flag. Chief Bugler, 6th New York Cavalry. Place and date: At Cedar Creek, Va., 19 October 1864. Entered service at: DeKalb, N.Y. Birth: Ireland. Date of issue: 26 October 1864. Citation: Capture of colors of 44th Georgia Infantry (C.S.A.). Private, Company D, 54th Ohio Infantry. Place and date: At Vicksburg, Miss., 22 May 1863. Entered service at: Cincinnati, Ohio. Birth: Ireland. Date of issue: 11 May 1894. Citation: Gallantry in the charge of the "volunteer storming party." Private, Company E, 4th Rhode Island Infantry. Place and date: At Petersburg, Va., 30 July 1864. Entered service at: Slatersville, R.I. Birth: Ireland. Date of issue: 3 June 1905. Citation: Bore off the regimental colors after the color sergeant had been wounded and the color corporal bearing the colors killed thereby saving the colors from capture. Captain, Chicago Mercantile Battery, Illinois Light Artillery. Place and date: At Vicksburg, Miss., 22 May 1863. Entered service at: Chicago, Ill. Born: 1833, Ireland. Date of issue: 15 January 1895. Citation: Carried with others by hand a cannon up to and fired it through an embrasure of the enemy's works. Private, Company E, 73d New York Infantry. Place and date: At Spotsylvania. Va., 12 May 1864. Entered service at: West Meriden, Conn. Birth: Ireland. Date of issue: 30 December 1898. Citation: Took the flag from the wounded color bearer and carried it in the charge over the Confederate works, in which charge he also captured the colors of the 56th Virginia (C.S.A.) bringing off both flags in safety. Private, Company G, 14th U.S. Infantry. Place and date: At Chapel House, Farm, Va., 1 October 1864. Entered service at: Woodstock, Conn. Birth: Ireland. Date of issue: 25 November 1869. Citation: Gallantry in action. The background music is "Eamonn Of The Hill."